We ended our weekend of fun with dinner at The Spence in Atlanta. While searching for a new place to try, we were given a recommendation for the new Richard Blais restaurant. Eric knows I am a Top Chef fan so this was a great option. The Spence is located in Midtown Atlanta near Georgia Tech so it was pretty convenient for us. I would say it is definitely a place for the adventurous foodie. Many of the menu items were not your average selection and I appreciated the unique variety they had to offer. Our waiter was fantastic! He was very knowledgeable with the wine selection and made excellent suggestions that we both enjoyed. 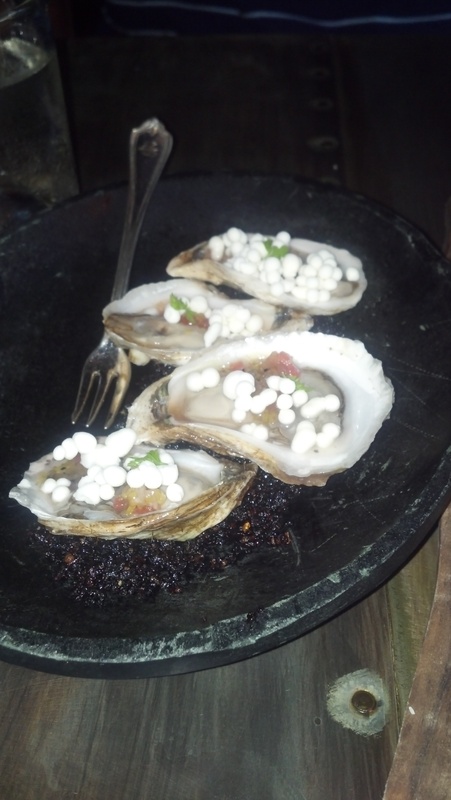 We decided to start with the oyster appetizer and later added the bone marrow (yes bone marrow) appetizer. They were both phenomenal. The bone marrow came topped with tuna tartar and 2 quail eggs. The trick is to mix everything together and then spread it over the toast! Yummy! I’ve had bone marrow before but never prepared this way and boy have I been missing out. 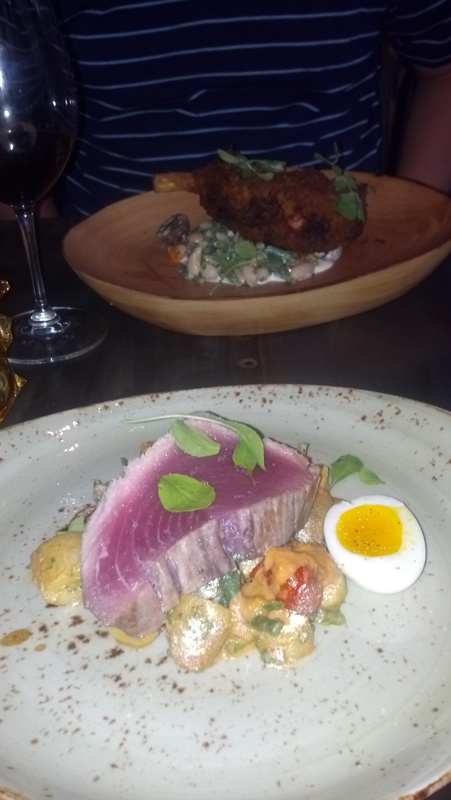 For dinner Eric had the country fried pork chop and I had the seared tuna steak. It looked like a lot of food at first but I ended up cleaning off my plate, no problem. Finally we ended with a chocolate dessert. At first glance it looked like a bunch of crumbled cookie pieces and ice cream spread all over the plate, but after combining it all, it was the perfect mix of flavors. A great dessert to end our meal! Each dish was amazing and the theatrical presentation was entertaining. (I saw some other tables receiving their meals in a smoking container, I’m curious about that one). 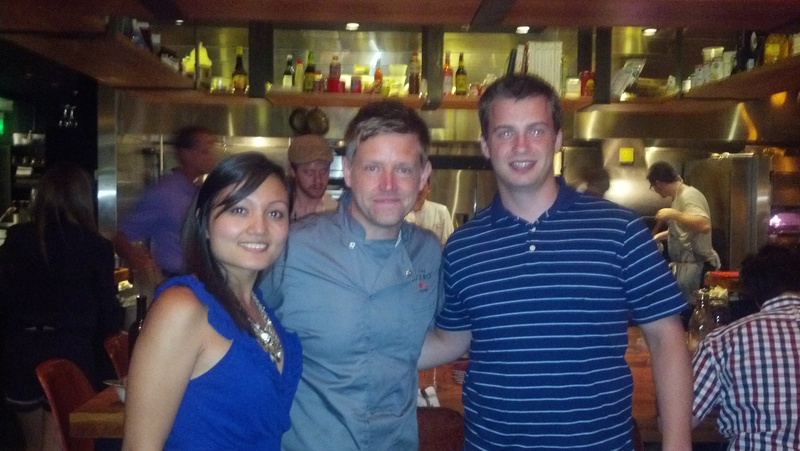 Because it was our anniversary, the dessert was complimentary and Richard Blais came out to congratulate us himself. It was wonderful dinner (good job planning Eric) and we will definitely be coming back to try the other dishes.